I’m writing to you in the midst of our first major do-it-yourself project in our home, and I’m happy to say that my and my wife’s sanity are still intact. We’re updating our only full bathroom, which was hardly HGTV-worthy when we bought our house in 2010. Whether it was the fish-themed wallpaper, the enormous wooden medicine cabinet, or the plastic shower stall, everything needed to go. But as you learn as a relatively new homeowner, you can’t snap your finger and have a glistening new bathroom; these changes take a lot of time. We made some minor cosmetic improvements a few months after moving in: wallpaper out, white paint in; medicine cabinet gone, mirror and wall-mounted light in. 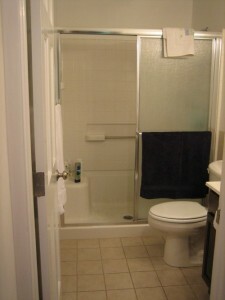 But the biggest issue with the bathroom was the huge shower stall and its sliding glass doors. As much as we wanted to install a bathtub, we wanted to get rid of that shower surround. The plastic actually covered up a window in the room, so this project will also finally add some natural light and keep the bathroom from feeling like a jail cell. About six months ago, we decided we were over the old-and-busted bathroom and ready for something fresh. We started saving about $600 to $800 each month to go toward the project; that cash would be primarily for a bathtub, wall tile, floor tile, a new vanity, and shower and vanity hardware. We knew we wouldn’t be able to handle the task of converting the bathroom plumbing from a shower to a bathtub/shower, so we called our neighborhood plumber and explained the job. We would do the demolition, he would come in an install the bathtub and proper plumbing, we would do the finishing tile work, and then he would come back and install the tub/shower hardware. Our plumber was impressed with our initiative, and he added that he lived down the street in case of any emergencies. This is what the bathroom looked at before we started the project. My wife and I took a week off from work, and we, with the help of my father, tore the room apart in one Saturday. The shower stall, some drywall and the floor tiles were gone. It was a lot of fun, but it revealed how much more work was in front of us. The plumber came and did his work in about six hours; the tub was in place, he added the drain and proper plumbing, and he added plumbing for the bathtub. 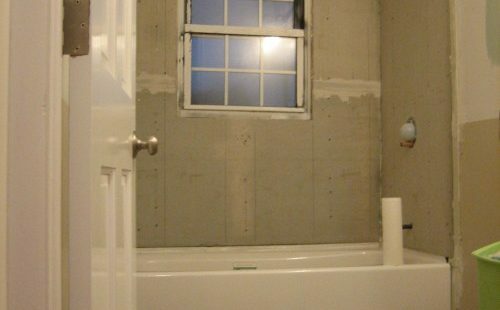 We tagged back in, and we added a plastic moisture barrier and installed cement board on the three walls around the bathtub. Right now, we’re tiling until our hands fall off. I’ve learned how to use a tile cutter, and my wife has become a pro at perfectly leveling grout lines. We still have to lay the floor tile, put some new paint on the walls, and grout, seal and caulk the tiles. It’s been quite a process, and I’m losing track of the days, but we’re getting closer to the bathroom we started envisioning last fall. And we know we’re saving some serious money in the process. Labor usually ends up being about a third of the project’s total cost, according to estimates from HGTV, These are rough numbers, but if we budgeted about $6,000 for the major bathroom pieces and other materials (cement board, random tools), labor would have set us back another $3,000. Depending on our plumber’s final bill, we’ll save about $2,000 to $2,250 by rolling up our sleeves. That’s like a direct deposit into our bank account. Now I hope my father doesn’t bill us, by surprise. And for those wondering, we have half-bath facilities in the basement, and we’ve been showering regularly at our local YMCA. Other very important questions to answer before a bathroom remodel: Where and when am I taking my next shower?